Erasmus studies can be very challenging, so selecting the right university is very important. Choosing Romanian-American University in Bucharest means getting high quality studies in an international university, a wide range of classes and courses in English, the possibility to meet people from various countries, living in the wonderful city, called "Little Paris" - Bucharest, travelling around the beautiful mountainous of Romania and much more. Every year we are delighted to host students from Europe and all over the world and provide them with the highest quality of education and the best Erasmus experience. 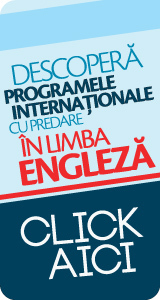 For the ones that would like to learn Romanian language and get to know our culture before the studies, Romanian-American University offers an Erasmus Intensive Language and Culture course, helping to get familiar with the new environment. The Romanian-American University places a high value on the academic contribution that you will make during your time with us. We are hopeful that in return, you will find your stay here, both intellectually stimulating and personally enriching.